APRIL 5–7, 2019 | COLLEGE STATION, TX Welcome to the cutting-edge of veterinary medicine! 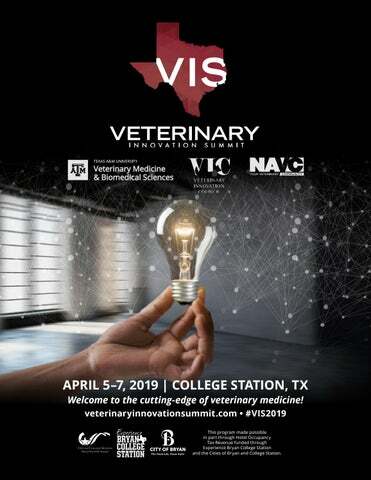 veterinaryinnovationsummit.com • #VIS2019 This program made possible in part through Hotel Occupancy Tax Revenue funded through Experience Bryan College Station and the Cities of Bryan and College Station. Bring your to Bryan College Station! Introduction Sponsors Welcome from Dr. Green Welcome from Dr. Massecar Things to Know Maps Schedule Speaker Biographies Startup Innovation Hall VIS 2020 Save the Date! Thank you to our #VIS2019 sponsors! Get to the heart of patient care. Remotely monitor patient care and stay connected with clients between visits? Easily share proof of vaccination with groomers, trainers, and others who request it? Reach new clients and grow revenue while saving time? BabelVet by BabelBark puts you at the heart of patient care, with an app for your clients, a health monitor for your patients, and a web portal for your practice. BabelVet works with your practice management software to create the most complete picture of a patient’s health to help you deliver better care while saving valuable time. We Know You’ll Love Your Time Here! Howdy, We are thrilled to have you join us for the third annual Veterinary Innovation Summit. If this is your first time here, get ready for an innovative experience like no other. If you’ve been here before, welcome back—we’ve been anxiously awaiting your return. The CVM and the NAVC began preparing for this weekend the day after the 2018 summit. Our goal is, and has always been, to assemble forward thinking individuals, both program participants and attendees, who will lead the veterinary profession into a successful future. We hope this event is transformative through incredible networking opportunities, a plethora of innovative ideas, and a broad range of world-famous leaders, scholars, creators, and entrepreneurs with whom to share ideas. We hope you will take advantage of all of the opportunities to engage, establish collaborations, and share innovative ideas. As you walk around our campus, you will notice the presence of students. They include program participants who will share their own innovations and entrepreneurial ideas, as well as student volunteers, who will assist in making sure that you are comfortable here. We are grateful that they care so much about being a part of the Veterinary Innovation Summit, because they are our future. They are relying on us to improve the veterinary space they’re about to enter, but they are also contributing their own innovative ideas. As one participant so perfectly stated last year at the end of the summit, “It was a phenomenal three days; there is a lot of great social networking going on, and I cannot wait to get back next year.” I will add to that by repeating what someone once said, “When we all think alike no one is thinking. ” The beauty of the diversity within the summit’s attendance is in the fact that we have so many people with different backgrounds, experiences, and aspirations bringing their thoughts together to map a better future for animals and people. There are many to thank for making the VIS possible. Those at Texas A&M and NAVC devoted untold hours to design and implement the program. The speakers have pledged to bring their best. Finally, we could not offer the VIS without the sponsors, whose names are listed in the program. This is an exciting time for veterinary medicine—we are leading the way; for that, and so much more, we are grateful. Welcome from Dr. Aaron Massecar I’m excited to welcome you to the third annual Veterinary Innovation Summit. We knew last year that we had caught onto something new, something that the profession was calling for, and we’re glad that you have decided to join us again this year as we kick off our third iteration. I hear a lot of people asking “What is the Veterinary Innovation Summit all about?” And I find it hard to answer them. It’s about new ideas, new technology, new business models, and visiting with new and returning friendships, but it seems to be so much more than that. VIS is a place for some of the most positive and forwardthinking people in veterinary medicine to gather and explore new ideas that are changing the way that veterinary medicine is being practiced. Our program kicks off with a bootcamp that focuses on the key areas of practice and professional growth, we spend the evening dining while talking about the future of food, we spend Saturday learning about new tech and new ideas from the leaders in our industry. Saturday night we introduce a pitch competition that is designed to encourage new growth. Sunday we return with more insights into practice into changing demographics and pain management. And we’re especially excited about hosting Daniel Kraft from Singularity University as he talks about the trends impacting the profession. We can’t thank Mars enough for their generous support of Sunday’s session. These are all amazing aspects that keep people returning again and again to College Station, but it’s more than that—it’s the experiences that aren’t on the program. It’s the student who said “I had no idea that all these amazing things were happening in the profession”, or the startup who said “I made more great connections here than any other conference”. That’s why we do it: to encourage people by giving them a place to explore positive growth opportunities. I love returning to College Station for the Veterinary Innovation Summit, and I hope you will too. The future of pet care? Letâ&#x20AC;&#x2122;s go. At Kinship, weâ&#x20AC;&#x2122;re a diverse coalition working to improve the lives of pets. A division of Mars Petcare, Kinship applies data and analytics capabilities to develop and grow science- and technology-based businesses that transform the pet care industry. striving to keep beloved animals free from injury and illness. accessible, and personalized to the needs of every pet. Visit us at kinship.co to learn more. •	Fill in your name and mobile number, and you will receive a password in an email and text message. •	Use your email and password to log in for the day, from the pop-up page. Visit www.veterinaryinnovationsummit.com to be directed to the feed. Don’t forget to get your badge when you register and wear it to all Veterinary Innovation Summit programs and events. Evaluations We want to hear your feedback! Look for our survey, which will be sent to you via email after the event. Please let us know your thoughts! Please Remember No recordings will be permitted in sessions. No children or guests will be permitted in sessions. Please be courteous and silence your mobile devices and laptops before sessions begin. Internet Access Complimentary Internet access will be provided throughout the event, but must be renewed on your device(s) each day. •	Connect to the network TAMU_Visitor in your device settings. •	Create a 24-hour account at the top of the pop-up page. Dining in Aggieland No trip to College Station would be complete without enjoying the delicious food in the area. From mom-and-pop diners to gourmet establishments, you’re sure to leave with a full stomach and happy heart. Please see below for restaurant suggestions within close proximity to VIS events. Fine Dining Porter’s Dining + Butcher The Republic Steakhouse | Veritas Wine & Bistro Sit-Down Meals Café Eccell | Napa Flats | Rosa’s Café On The Go Fuego Tortilla Grill Piada Italian Street Food | Torchy’s Tacos Whatever your appetite, Bryan/College Station offers a tantalizing menu of restaurants for your dining pleasure. Visit www.experiencebcs.com/ restaurants to find a full list of restaurants. 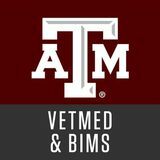 The Veterinary Innovation Summit is approved for veterinary continuing education (CE) credits by the Texas A&M College of Veterinary Medicine & Biomedical Sciences (CVM). A veterinarian may earn up to 17 hours of CE credit at the 2019 event. For veterinarians licensed in Texas to receive CE credit, we will have the following procedures in place: •	Attendees will scan their credential to “checkin” for CE at the time of registration. •	Attendees will receive a preprinted checklist in their packets so that they may conveniently record which sessions they attend. •	In order to document attendance at the meetings, in case of an audit by Texas Board of Veterinary Medical Examiners (TBVME), attendees must present BOTH the CE certificate and the session checklist. •	In accordance with the regulations of the TBVME, we may not distribute certificates prior to the end of VIS or until the attendee is leaving the event. •	Don’t forget to pick up your CE certificate before you leave! CE Certificates are not allowed to be mailed. Friday, April 5 | Parking: After 5:00 pm Free parking in Lot 62 for Kyle Field – Hall of Champions. Texas A&M Lot 62 Friday, April 5 | Round-trip Shuttles: 7:00 am–10:00 pm Shuttle buses will run continuously from 7:00 am to 10:00 pm on Friday from The Stella Hotel, The George and Calvary Court to Texas A&M Hotel and Conference Center during the day and Kyle Field – Hall of Champions for evening events. Saturday, April 6 | Parking: 7:00 am–10:00 pm Free parking in Lot 24, Lot 13 and Lot 101. All reserved spaces are 24 hour, and numbered or otherwise designated spaces may not be utilized. Texas A&M Lot 24 Saturday, April 6 | Round-trip Shuttles: 6:00 am–9:00 pm Shuttle buses will run continuously from 6:00 am to 9:00 pm on Saturday from The Stella Hotel, The George, Calvary Court and Texas A&M Hotel and Conference Center to VBEC. Sunday, April 7 | Parking: 7:00 am–2:00 pm Free parking in Lot 24, Lot 13 and Lot 101. All reserved spaces are 24 hour, and numbered or otherwise designated spaces may not be utilized. Texas A&M Lot 24 Sunday, April 7 | Round-trip Shuttles: 6:30 am–3:00 pm Shuttle buses will run continuously from 6:30 am to 3:00 pm on Sunday from The Stella Hotel, The George, Calvary Court and Texas A&M Hotel and Conference Center to VBEC. #VIS2019 Speaker Biographies Brenda Andresen Chief Strategy Officer, Stephens & Associates Advertising; Founding Partner, The Bridge Club A connector, collaborator, and confidante who values sincerity and friendship above all else, Brenda has built her career on a belief in the power of mutually beneficial relationships, effective brand positioning and messaging, and a commitment to forward thinking. She is a veterinary industry insider who is well known and well respected across the veterinary profession. With a history of leadership experience in client-side marketing communications, agency-side account management, non-profit organization, and sales, Brenda brings a unique and threedimensional approach to marketing strategy to Stephens & Associates. She leads the development of client marketing and business strategy across the agency and seeks, identifies, and implements innovative strategies and solutions while providing leadership, development, and strategic direction for the S&A team. Brenda is also founding partner of The Bridge Club, the first videoconference-based community created to inspire professionals to connect, engage, learn, and grow through topic-centric 25-minute conversations. Brenda established the “original” Bridge Club to connect veterinary industry friends together and founded the formal business with friend and professional colleague Catherine Haskins. Together, Brenda and Catherine are combining their unconventional ideas and energy to benefit a broad community of professionals. furthering his passion for the business side of Veterinary Medicine completed his MBA at the Richard Ivey School of Business in 2015. After graduation, Glenn’s focus has been on strategy development in veterinary medicine with an emphasis on creating structured decision making processes and achieving stakeholder consensus. Glenn has presented on this topic at several veterinary associations including LAVA, NOVA and the OVMA. He is actively involved in the veterinary community having done a six-year term on the Colleges Complaints Committee and currently serves on the Ontario Veterinary Medical Associations Board of Directors, Economics Committee and Large Animal Issues Committee. His goal for participating in #VIS2019 is to improve the financial wellbeing of all veterinarians. over 9,000 active PIMS customers and more than 35,000 customers of VetConnect® PLUS. Recently, Smart Flow workflow optimization software joined the IDEXX family. Outside of IDEXX, Jon enjoys time with his wife and three grown children, and is an avid cyclist. He and his wife recently established a foundation to support the conservation of the 41 felidae species in the wild and the vast landscapes upon which they depend. Ryan Bethencourt (@RyanBethencourt) Co-Founder & CEO, Wild Earth (@WildEarthPets) Ryan is co-founder and CEO at Wild Earth, a biotech startup developing clean, nutritious and sustainable Pet Food and is backed by some of silicon valley leading investors. He’s also a Partner at Babel Ventures, a leading early stage biotech venture capital firm . Ryan has years of experience in leading, building and advising high-growth food and biotechnology companies. Ryan was previously, co-founder, former Program Director, and Venture Partner at IndieBio and has invested in over 80 early stage biotech startups and served as the head of life sciences at the XPRIZE Foundation. Ryan focuses on using biology as a technology to solve some of the world’s most intractable problems including the future of food, medicine, biological computation, consumer biotech and environmental challenges. staff, Tom supports each group toward growth and achievement of the organization’s strategic plan. Tom is a Certified Association Executive (CAE) with over 20 years of experience working with local, state, national and international associations. Tom has served as the executive director and CEO of several associations, including The Institute of Internal Auditors, ranging from $2-25 million in revenue representing many different constituencies and professions. He has personally directed all aspects of association management including marketing, event management, membership development, leadership development, conferences, fundraising, certification programs, lobbying and more. He has also led several associations through successful mergers. In addition, he is a nationally recognized association leader whose articles have appeared in leading journals and magazines including the ASAE’s Associations Now and Association News Magazine. He has also co-published a peer reviewed academic paper on customer service best practices for associations. A sought after and dynamic public speaker, Tom has presented to groups large and small and has been a guest on Bloomberg News Radio and Fox Business Channel discussing topics on association management, document management, image to archive, taxation, automation and more. He has an MBA from the University of Central Florida. Tom has an Old English Sheepdog named Winston Churchill and a Golden Retriever named Derby. He lives in Orlando with his son, Hudson, and his wife, Jennifer. He’s a huge Springsteen fan and a fan of his son’s lacrosse skills! In addition to his full time role, he partners with various organizations such as the Veterinary Information Network, Penn Foster, State Health Departments, One Health CDC, and Medical Volunteer Organizations. He is currently serving as the Vice President-elect for the Virginia Association of Licensed Veterinary Technicians and actively leads strategic planning for the state. He speaks at various conferences on a wide variety of topics and loves to be involved wherever possible. He graduated from the Blue Ridge Community College’s Veterinary Technology program in 2009 and continued his education to complete his Masters of Public Health - Concentrated Infectious Disease Epidemiology at George Mason University in 2017. He recently began a Doctoral program in Public Health focused on Leadership. Professionally, his interests are infectious disease outbreak investigations, leadership, animal health and quality connections. In his free time, DJ loves to travel on spontaneous adventures with his Australian Shepherd- Dahlia. He lacks the ability to sit in one place and brings to us a wide variety of experiences in academia, small animal practice, zoo medicine, organizational transformation, and lean six sigma operational excellence. 2017, she moved to the Digital Health team in a new business unit for Mars Petcare, Connected Solutions. She envisions technology as a way to help solve some of the hard problems facing veterinarians in practice today and enjoys working at the junction of new technologies and veterinary medicine. Grounded by years of clinical practice, she enjoys sorting out the practical application of big data and finding solutions for what matters to “me and my pets” – namely, how to provide top-notch, technologically-guided care with a compassionate human touch. Excited for the future, Dr. Carson currently serves as the project manager for the Pet Insight Project, a joint research collaboration between Banfield and Whistle. When not at work hanging out with Sandy, her German short-haired pointer, Dr. Carson can be found at home with her family or sneaking off to the deep woods on one of her six horses. Stephen Cital (@StephenCital) Registered Veterinary Technician, Silicon Valley Veterinary Specialists Stephen originally started college to become a registered human nurse but did not enjoy working with humans as patients. Instead, Stephen became an RVT and then obtained certification as a Surgical Research Anesthetist through the Academy of Surgical Research followed by the designation of a Registered Laboratory Animal Technician through the American Association of Laboratory Animal Science soon after. Most recently he became one of the first Veterinary Cannabis Counselor Specialists in the country while continuing to educate veterinary professionals on safe and effective use of cannabis in the clinical setting. Stephen is the Executive Director for the Academy of Laboratory Animal Veterinary Technicians and Nurses, holding a VTS credential in Research Anesthesia. His regular daytime position is at Silicon Valley Veterinary Specialists, as well as a private contractor for several research organizations and two local zoo’s. He occupies his remaining time writing book chapters, is a column coordinator for one of Nature’s journals, blogs and lectures internationally. He enjoys teaching and serves on advisory boards for local Vet Tech colleges, is on the Aratana Technician Council of Pain Experts, is a consultant for Veterinary Cannabis, LLC., ElleVet Sciences and Beryl Therapeutics, COO for the Veterinary Anesthesia Nerds and Veterinary Cannabis Academy Facebook and webpages. Stephen has served as the President for the Society of Laboratory Animal Veterinary Technicians, Vice President for the California RVT Association and member at large for the National Association of Veterinary Technicians in America. Stephen is currently the Chair-elect for the Committee of Veterinary Technician Specialties. AVAILABLE NOW ON PURINAFORPROFESSIONALS.COM. *McGowan, R. T. S. (2016). “Oiling the brain” or “Cultivating the gut”: Impact of diet on anxious behavior in dogs. Proceedings of the Nestlé Purina Companion Animal Nutrition Summit, March 31-April 2, Florida, 91-97. Purina trademarks are owned by Société des Produits Nestlé S.A.
tissue surgeon with interests in communication skills training for veterinary professionals, teaching methodologies, and reconstructive surgery. She is a two-time recipient of the Carl NordenPfizer Distinguished Teaching Award and in 2011 she was named a Josiah Meigs Distinguished Teaching Professor, the highest award for teaching at UGA. Karen became involved with communication training in 2003, when she was a participant in the first Bayer Communication Project train-the-trainer program for veterinary faculty. She has served as a trainer for each of the subsequent annual veterinary faculty courses offered by the Institute for Healthcare Communication. Mark L. Cushing (@cushingapg) Founding Partner, Animal Policy Group A long-time political strategist, lobbyist, corporate executive and former litigator, Mark focuses his advocacy practice on providing high-level strategic advice, state and Federal lobbying, and consulting services to clients with needs at any level of government, and key trade/ industry associations in the U.S., Canada and Mexico. He maintains offices in Portland, OR; Scottsdale, AZ; Knoxville, TN; and Washington, DC. Mark is the Founding Partner of the Animal Policy Group, LLC. Since 2004 he has specialized in animal health, animal welfare, veterinary and veterinary educational issues, developing a cutting-edge practice across these sectors. He also serves as University Counsel and VP of Public Affairs at Lincoln Memorial University in Harrogate, TN and Policy Advisor to the Center for Animal Health in Appalachia. Mark is a frequent speaker at veterinary medicine and other animal policy-related conferences. He is a professor at the LMU Duncan School of Law, a prior adjunct faculty member in Animal Law at the Lewis & Clark Law School in Portland, and a visiting lecturer at the University of Oregon School of Law. He is an honors graduate with distinction from Stanford University and the Willamette University College of Law. Scott Echols (@spotdvm) Co-Founder & Avian Specialist, Avian Mobile Surgical Services M. Scott Echols, DVM, Dipl ABVP is an avian specialist living in Salt Lake City, Utah. As the Cofounder of Avian Mobile Surgical Services (Medical Center for Birds), founder of Avian Studios, LLC (www.avianstudios.com) and Scarlet Imaging (www.scarletimaging.com) and co-director of The Grey Parrot Anatomy Project (www.avianstudios.com/the-grey-parrot-anatomyproject), Dr. Echols keeps busy practicing, teaching, lecturing, writing, consulting and researching throughout the US and abroad. Dr. Echols is an Adjunct Professor and Distinguished Alumnus of Texas A&M College of Veterinary Medicine. He has also served as a Past President of the Association of Avian Veterinarians and has received the 2005 T.J. Lafeber Avian Practitioner of the Year Award and the 2007 Texas Veterinary Medical Association Non-Traditional Species Practitioner of the Year Award. Jesper Frederiksen (@MarsPetCareUS) Chief Information Officer, Mars Veterinary Health Group Jesper Frederiksen joined Banfield in October 2017, as the Senior Vice President and Chief Information Officer (CIO). In January 2019, he moved into a newly created role of CIO of Mars Veterinary Health Group. During his tenure at Banfield, Jesper provided overall leadership and direction to all areas of the Information Technology organization, led organizational changes that position Banfield for growth, established an IT strategy and delivered important cultural shifts in digital and innovation across the Banfield enterprise. In his current role, he is responsible for developing key business relationships within Mars and the industry to build a strong IT and digital community, while playing a critical role in building the infrastructure that will support ambitions for a seamless and accessible network of care. On the personal side, Jesper earned a mathematics degree from Vordingborg State College in Denmark. He and his wife, Annika, have two children and a Cockalier named Jacob. They reside in Portland, OR. Jesper is an avid cyclist. He and his family also enjoy spending time exploring the Pacific Northwest. Consortium, American Quarter Horse Association, Florida Quarter Horse Association, the National Cowgirl Museum and Hall of Fame, and the NAVC Veterinary Innovation Council. She has been a member of the AQHA Animal Welfare Commission since its inception, currently serving as chair. She just completed a term as chair of the AQHA Public Policy Committee. She is also chair of the AVMAAAVMC Veterinary Futures Commission. She has been active in her community as a member of Rotary International, having served as President of the Rotary Club of Gainesville. She has volunteered time to various student and youth groups, such as 4-H and gifted student programs. Her awards include: 2004 Award of Distinction from the University of Florida College of Agriculture and Life Sciences, 2011 Wilford S. Bailey Distinguished Alumni Award from Auburn University, 2012 Women‘s Progress Award for Administration, induction into the National Cowgirl Hall of Fame in 2013, and 2015 Distinguished Achievement Award for Administration at Texas A&M University. Dr. Green has a special interest in the future of veterinary medicine and the innovations that will help ensure a thriving profession. Kurt Green (@vetsource) President & CEO, Vetsource Kurt serves as President and CEO of Vetsource. Kurt joined the company in 2007 when Sequoyah Technologies, a company he founded in 1999, merged with Vetsource prerevenue. Prior to founding Sequoyah Technologies, Kurt served as CEO of Cimcase International, as well as holding several management positions with Fortune 100 firms within the information technology industry. When Kurt is not working at Vetsource, he enjoys an active outdoors lifestyle in the Pacific Northwest, especially golf. He has two Miniature Australian Shepherds: Gabriel, a red solid, and Gideon, a red merle. The future of animal health today Welcome to Covetrus, an animal health technology and services company developing new kinds of services and solutions essential to modern veterinary practices. By bringing together Henry Schein Animal Health and Vets First Choice, weâ&#x20AC;&#x2122;ve combined a deep portfolio of clinical products with new, data-driven insights and user-friendly business tools to support any practice. Learn how Covetrus keeps the vet at the heart of all we do. Continually advancing the practice of veterinary medicine to improve animal and human health. David Hall (@GeniusVets) Founder, theSEOeffect.com Director of Digital Marketing, GeniusVets David founded theSEOeffect. com, an online training resource for digital marketing agencies, and has acted as the Director of SEO strategy for four top digital agencies. David has delivered incredible results for clients ranging from local and regional businesses to global Fortune brands. He now directs the development of the digital marketing toolset used by GeniusVets to help top veterinarians grow their practices. Michael Hutton (@boehringerus) Head of Pet Vet Marketing, Boehringer Ingelheim Animal Health, Inc. Mike leads the U.S. marketing team in the creation of strategies and tactics to maximize sales and income across the entire Pet Vet franchise Mike joined Boehringer Ingelheim (with Merial) in 1998 as the Head of Marketing for New Zealand. He has since held various global and local marketing roles in France and the U.S., as well as Country Head of Canada. Mike is originally from New Zealand where he grew up on a sheep and crop farm. He holds a Bachelor of Commerce degree from Lincoln College, University of Canterbury. leader, he led a significant digital transformation. The global marketing team adopted agile and design methods and implemented a modern technology stack and performance marketing practices. IBM’s brand is one of the most valuable in the world, a status enhanced by brand platforms that express IBM’s purpose and point of view on technology’s impact on business and society. Jon is the architect of several of these platforms: e-business, when the Internet was emergent; Smarter Planet, which described how all systems —from power grids and supply chains to healthcare and cities —would be transformed by the phenomenon of data; and Watson, which heralded the era of Artificial Intelligence. Jon reported to three IBM CEOs during two decades of significant transformation of the information technology industry, global business and geopolitics. He maintains a relationship with IBM as Senior Advisor to Ginni Rometty, IBM Chairman, President and Chief Executive Officer. In addition to his fellowship at Yale, Jon is a trustee of Cooper Hewitt, Smithsonian Design Museum, and a director of the Ladies Professional Golf Association. Jon is an inductee of the Marketing Hall of Fame, the CMO Club Hall of Fame and the Page Society Hall of Fame, which honors lifetime achievement in business communications. He was named a Brand Genius by AdWeek in 2017. Jon holds a B.A. from the School of Journalism and Mass Communications at San Jose State University. He is co-inventor of a U.S. patent for nanotechnology for semiconductor design and fabrication. aim is to improve the animal health and human health of the Appalachian region. He currently serves on the Legislative Advocacy Committee representing AAVMC, and serves the Society for Theriogenology in the AVMA House of Delegates. He was recently selected to be one of eight persons in the USA on the joint AVMA/ AAVMC Veterinary Futures Commission. He has been honored to receive numerous awards including honorary diplomate status recognition by The American Society of Epidemiologists, Auburn Young Achiever Award, AVMA Future Leaders, Veterinary Business News top 25 vets to watch in our 25th year, Ron Taylor Excellence in Teaching Award and the East Alabama VMA Leadership Award. He has delivered keynotes and been on over 70 papers, presentations and abstracts. Johnson is a 2003 graduate of the Auburn University College of Veterinary Medicine and a diplomate in the American College of Theriogenologists. He was a private practitioner for years, after which he completed a three-year residency at Auburn University in theriogenology, while earning a master’s degree. Dr. Johnson is a native of Luverne, Alabama. He is married to his wonderful bride of fifteen years, Jennifer, and they have a ten-year-old son, Elijah. process before eventually stepping away to work with the Veterinary Entrepreneurship Academy as Program Manager and assist with the Veterinary Innovation Council. Her professional time is now occupied by Modern Animal, a company that is redesigning current practice models to address the issues of wellness, efficiencies and client experience. She still appreciates working with small businesses and continues to help practices grow through her company, Seashell Consulting, LLC. When not working, she’ll be outside playing with her two wonderful children and crazy supportive husband...and maybe a dog or two. (Class 13) and member of the Inaugural (2015) class of the Aspen Institute Health Innovators Fellowship. He is the inventor of the MarrowMiner, an FDA approved device for the minimally invasive harvest of bone marrow, and founded RegenMed Systems, a company developing technologies to enable adult stem cell based regenerative therapies. Daniel is an avid pilot and has served in the Massachusetts and California Air National Guard as an officer and flight surgeon with F-15 & F-16 fighter Squadrons. He has conducted research on aerospace medicine that was published with NASA, with whom he was a finalist for astronaut selection. serves at Chief Technology Officer, responsible for technology innovation. In the past year QT received FDA clearance for their quantitative transmission ultrasound breast imaging products, a new paradigm in breast cancer detection, and is now in the process of commercializing those systems to bring a new level of healthcare to all women. Darren Logan (@darrenlogan) Head of Research, WALTHAM Centre for Pet Nutrition, (@waltham_science) Mars Petcare Darren Logan is Head of Research at The WALTHAM Centre for Pet Nutrition, the home of fundamental science within Mars Petcare. He leads a team of approximately 80 scientists and veterinarians who undertake programmes of research to improve the health and wellbeing of cats, dogs, fish, horses and the people who own them. Darren holds a PhD in Genetics from the University of Edinburgh, and undertook postdoctoral training at the Scripps Research Institute. Prior to joining Mars he was an assistant Professor at the Wellcome Sanger Institute, where he conducted research into the genetic basis of smell and taste. healthcare service, which provides owners with the most affordable and convenient way to access vet care by partnering with local veterinary practices. He served as the first ever Director of Innovation & Entrepreneurship for Texas A&M College of Veterinary Medicine & Biomedical Sciences where he spearheaded such initiatives as the Veterinary Innovation Summit and the Veterinary Entrepreneurship Academy and currently holds an adjunct faculty appointment. Dr. Little holds a Doctor of Veterinary Medicine degree from the Ontario Veterinary College and was the first veterinarian to complete the Graduate Studies Program at Singularity University. He is a past Board member of the Ontario Veterinary Medical Association and Veterinarians Without Borders and currently serves on the Board of Directors with the Catalyst Council and the Vet Futures Commission. and business knowledge is available tailored and applied to local situations. The educational events provide industryfocused programs and content built around the needs and schedules of veterinarians and practice managers. The management services focus on practical insights and solutions that make an immediate and long-term positive impact. Kerri Marshall (@kerrimarshall13) Chief Veterinary Officer, BabelBark (@BabelBark) Dr. Kerri Marshall is a secondgeneration veterinarian who focuses on veterinary innovation. After 10 years of practice, Dr. Marshall joined the founding management team at Banfield Pet Hospitals® and served as Director of Operations and Sr. Director of Informatics. In 2011, she joined Trupanion® as chief veterinary officer and is the inventor on the patented software Trupanion Express®. Currently, Dr. Marshall is chief veterinary officer, board member and investor at BabelBark®--a unique software platform creating a digital ecosystem connecting pet parents to all their pet care services and providing a virtual care platform for veterinarians. In 2018, she was honored to receive the NAVC Veterinary Innovation Council’s first ever award for Veterinarian Innovator of the Year. Office of Veterinary Innovation & Entrepreneurship with Dr. Adam Little and Dr. Eleanor M. Green. Two of the most prominent accomplishments from that office include the Veterinary Innovation Summit and the Veterinary Entrepreneurship Academy— programs that help spur new ideas and train future veterinarians to run successful, lean operations. The time at the Veterinary Innovation Council helped to produce a new understanding of telemedicine that empowered veterinarians to utilize virtual tools to reach more clients and provide stable revenue streams for clinics. Up until Aaron transitioned into the veterinary space in 2016, he spent his undergraduate, master’s, and PhD in philosophy working on a deeper understanding of habits—how sometimes we have habits and sometimes habits have us. When Aaron is not working on building Continuing Education programs for veterinarians, you can find him, his wife, and two dogs hiking up in the Colorado mountains. International Fellowship church board, Centric Indy, Texas A&M University College of Engineering Board (Vice-Chairman) and Sub-committee on Commercialization & Entrepreneurship (Chairman), the Brendonwood Association (Vice-President) the Shanghai American Football League Board (which was associated with NFL China), and the Tocqueville Council for the United Way of Central Indiana (Vice-Chairman). He has been married for 25 years to Patricia, and has 2 sons; Donovan, 19 years old, and Chandler, 17 years old. Michael Morehead (@michael_syglass) Co-Founder & CEO, syGlass (@syGlassVR) Michael Morehead is the cofounder and CEO of syGlass, a small software startup focused on visualization and annotation of very large volumetric data sets in virtual reality. He holds a Masters of Science in computer science and spent six years embedded in the Spirou neuroscience lab working on various research topics, including image processing, 3D segmentation, and applying shape-context machine learning to neuron morphology. Sciences department at Texas A&M as a Clinical Assistant Professor in 2015. Dr Navas’ clinical activity and research focuses on equine ultrasound and cardiology. He has developed several innovative teaching materials related to cardiology and ultrasound and has written 31 peer-reviewed journal articles and 3 book chapters. Dr. Navas received the 2018 Juan Carlos Robles Award, the 2017 Best Scientific Poster at the International Network of Equine Science Meeting, and the 2007 University of Illinois VTH Golden Oar (Hospital Service) Award. building the emotional connections of customers and gatekeepers to these brands, and leading data-driven departments to ensure decisions are made from a complete fact base. Want the skinny on my hyperthyroidism? It’s hiding my loss of kidney function. Only available from IDEXX Reference Laboratories and on Catalyst One® and Catalyst Dx® chemistry analyzers. Diagnostics give your patients a voice. Diagnostics give your patients a voice. IDEXX-exclusive innovation expands their vocabulary. IDEXX-exclusive innovation expands their vocabulary. Help more pets get the care they deserve with pet insurance from Nationwide®. her work in mentoring women and helping them advance their careers in animal health. Ms. Peck holds a bachelor’s degree from Georgetown University and a Master of Business Administration from Columbia Business School. Ray Pentecost (@TAMUARCH) Director & Professor of Practice, Texas A&M Center for Health Systems & Designs Dr. Ray Pentecost is the Director of the Texas A&M University Center for Health Systems & Design, based one half each in the College of Architecture and the College of Medicine, and holds the Ronald L. Skaggs and Joseph G. Sprague Chair of Health Facilities Design. Ray is a Past President of the International Academy for Design & Health in Stockholm, a Past President of the American College of Healthcare Architects, and a two-time Past President of the AIA Academy of Architecture for Health. In 2012 Ray was one of only eight individuals named to Healthcare Design Magazine’s list of “The Most Influential People in Healthcare Design.” Ray trained in architecture at the Rice University College of Architecture, and public health at the University of Texas, School of Public Health, both in Houston. Jessica Quillivan (@TBVME) Founder & Veterinarian, Emergency Pet Care of Texas Dr. Jessica Quillivan is a 1999 graduate of the Texas A&M College of Veterinary Medicine & Biomedical Sciences. She founded Shady Brook Animal Hospital in 2004, and Emergency Pet Care of Texas in 2014. She has served on the Board of Directors for AAHA, as well as AAHA’s Animal Ethics and Welfare Committee. She currently serves as AAHA’s Alternate Delegate to the AVMA Animal Welfare Committee. She has served as Vice President of her local Montgomery County VMA and currently is the presiding officer of the TBVME. Julie Reck Co-Founder & Chief Veterinary Officer, Aspire Dr. Reck is a veterinarian with passion for creating new communication avenues with pet owners. In 2010, Dr. Reck published Facing Farewell, a book dedicated to providing pet owners with information to assist them with making difficult end of life decisions for their pet. Facing Farewell was awarded the Maxwell Medallion of Excellence for the best book in pet care and health by the Dog Writers Association of America at the 2010 Westminister Dog Show. Dr. Reck is the co-founder and Chief Veterinary Officer for Aspire, which provides online leadership and management training to the veterinary profession. She volunteers her time to serve on the executive council for Fear Free where she advocates for independent practice owners. Ken Rotondo (@DrKenRotondo) President, Mind Genomics Advisors (@MindGenomics) Ken Rotondo is an authority on consumer experience engineering, client/patient communication, and empirical messaging insights. He has served on the Advisory Counsel to the Dean at the Veterinary College, Cornell University, is a Past President of the New York State Veterinary Medical Society, and represented New York to the AVMA. Currently he is an annual guest lecturer at the Wharton Business School, RPI Lally School of Business, Villanova, Cornell University and Skidmore College. He serves on the Canadian Bio-Alliance Mentoring Board, the AVMA “Futures Commission”, and several not-for-profit boards. As President of Mind Genomics Advisors he has presented at IBM Watson Conference, IBM THINK, Social Media Week NYC, HMSS19, and a variety of medical and professional conferences. Matt Russell (@IDEXX) Senior Director, Enterprise Platforms, IDEXX Matt leads the IDEXX Enterprise Platforms business, including Practice Intelligence, DataPoint, rVetLink and Enterprise Manager. He has 20+ years of experience in the animal health industry, as a veterinary technician, practice manager, entrepreneur, and business leader. Matt has co-founded four successful startups including Odyssey Software, developers of the Diagnostics Imaging Atlas (DIA) that was acquired by Patterson in 2008. His latest startup projects, rVetLink and DataPoint, joined the IDEXX family in 2017. Elizabelth Scallan (@tamuvetmed) Clinical Assistant Professor, Texas A&M College of Veterinary Medicine & Biomedical Sciences Elizabeth “Beth” Scallan, DVM, MBA, MS, BS, CVA, CCRP, is the director of the Clinical Skills Lab at the Texas A&M University College of Veterinary Medicine & Biomedical Sciences. Her experience includes small animal practice, equine sports medicine, and ambulatory practice, as well as certifications in acupuncture and canine rehabilitation. Her research includes validation studies on teaching models created at Texas A&M, acupuncture, opioid receptor studies, and pain management. Patient specific therapeutic interventions and devices are of special interest. In her spare time, she is a mother of three young children, snow boarder, surfer, and lover of the outdoors. State University receiving an M.S. in Animal Science and completed her education at Texas Tech University, receiving a Ph.D. in Nutritional Immunology. Currently, Dr. Sharon is a postdoctoral research scientist in statistics with Elanco Animal Health where she is exploring applications of activity monitoring devices in companion animal research. Pearl District. She also enjoys watching movies, reading, and cooking. Lori Teller (@tamuvetmed) Clinical Associate Professor, Texas A&M College of Veterinary Medicine & Biomedical Sciences Dr. Lori Teller is a graduate of the Texas A&M College of Veterinary Medicine & Biomedical Sciences (CVM) and a board-certified Diplomate of the American Board of Veterinary Practitioners (ABVP) in Canine and Feline Practice. She practiced at Meyerland Animal Clinic for almost 3 decades where she had a special interest in cytology, geriatric medicine, and immunemediated diseases. She then developed an interest in telemedicine and the role it will play in the future of the veterinary profession. Dr. Teller subsequently joined the faculty of the Department of Small Animal Clinical Sciences at the CVM, as the Clinical Associate Professor of Telehealth, where she is developing the virtual care program, as well as instructing veterinary students in clinical practice. She also serves on the AVMA Board of Directors and chairs the AVMA State Advocacy Committee. Additionally, she is a trustee for the Texas Veterinary Medical Association’s VPAC. Outside of work, Dr. Teller loves to exercise and read, and she and her husband love to travel and explore new places. Some of her favorite things include chocolate chip cookies, corny jokes, and puppy breath. currently is the Head of Health at Fuzzy Pet Health, a technology company offering in-home and virtual care veterinary services. In her spare time, Jess enjoys backpacking and painting. Founder, Veterinary Future Society Dr. Rolan Tripp received his doctorate from UC Davis veterinary school and holds a Bachelor’s Degree in Music Performance. He also holds a degree in Philosophy with emphasis on Ethics and Logic. He published his first Veterinary Futurist article, “Veterinary Telecommunications” In 1984. Dr. Tripp is a Past Chair of the Subcommittee Reviewing the AVMA Policy on remote consulting, and founder of the Animal Behavior Network where he has been providing Teleconsulting nationally for 15 years. In 2011, Dr. Tripp gave the keynote address, “The Future of Veterinary Medicine” at an international veterinary meeting in Canada known as “CanWest”. In 2018, he spoke at the Veterinary Innovation Summit on the future of Televeterinary Practice. He is founder of the Veterinary Future Society (www.VeterinaryFutureSociety.org). Executive Chief Strategic Innovation & Digital Experience Officer, Petco (@Petco) As Executive Chief Strategic Innovation & Digital Experience Officer, Brock is responsible for fostering and accelerating innovation across Petco’s business, incubating new ideas and ensuring the company’s long-term relevance. Additionally, Brock leads Petco’s e-Commerce and digital strategy. Brock joined Petco in 2017 when the company acquired PetCoach, of which he was CEO and co-founder. PetCoach is a first-of-its-kind pet care store concept offering the highest-quality suite of personalized pet services, products and experiences, all designed through a veterinary lens to address total pet health and wellness. Previously, Brock was a Venture Partner of tech accelerator ICONYC Labs and Managing Director of his angel investment fund, Atai Ventures. He also served as Senior Vice President and Chief Digital Officer at PetSmart after selling Pet360, where he was CEO for five years. He was also co-founder and CEO of startup Fathead and a senior leader at InterActiveCorp. Vice President, Sales & Marketing, BabelBark (@BabelBark) Bruce Truman is a companion animal health business executive with over 20 years of experience specializing in PetTech. His areas of expertise are business development, companion animal healthcare informatics, emerging digital technologies, diagnostic startups, as well as the marketing and sales management of veterinary and OTC animal health products/ services. As VP of Sales & Marketing at BabelBark, Bruce focuses on connecting pet parents, veterinary professionals, and pet professionals in ways that will enable pet parents to provide their pets with the happiest, healthiest life possible. Ophthalmology at Iowa State University and a Master of Business Administration degree at Colorado State University. Pat founded VetBloom in 2011 and has overseen VetBloom’s delivery of curricula, Continuing Education, and skills protocols to Ethos teams, and to an increasing variety of external individuals, organizations, and associations. entrepreneurs. Today it has 1,500 members. He stayed focused on technology through the years and founded the Open Cloud Institute at the University of Texas at San Antonio, an initiative to develop degree programs in cloud computing and big data. He has also established the Open Cloud Academy, which is approved by the Texas Workforce Commission. The Academy is a full-time, 9-week, cyber-security boot camp in San Antonio where students are able to achieve industryrecognized certifications and gain hands-on experience. The goal is to develop technical talent and enhance technical career opportunities in Texas. Graham Weston has been broadly recognized for his contributions to the business community in San Antonio as well as for his role in city planning endeavors as a tri-chair on Mayor Castro’s SA2020 committee. He was inducted into the San Antonio Business Hall of Fame in 2011 and has been recognized several times as a distinguished entrepreneur by various organizations. He was commended by the City of San Antonio for his role creating shelters to help victims of Hurricanes Katrina and Rita. He served on the board of regents at Texas Lutheran University and is currently a board member at Frost. He earned a BS from Texas A&M University. Offer home delivery for better care and business growth *Shipping rates and discounts are subject to change. ©2019 Hill’s Pet Nutrition, Inc. ®/™ Trademarks owned by Hill’s Pet Nutrition, Inc.
Pet Insight Project is a pioneering mission to collect and interpret the health stories of hundreds of thousands of dogs to improve the lives of pets everywhere . ABOUT PET INSIGHT PROJECT Your petâ&#x20AC;&#x2122;s behavior offers extraordinary, yet often hidden, insights into his or her well-being. By observing petsâ&#x20AC;&#x2122; behavior and health histories with unprecedented detail and scale, we seek to detect previously unseen patterns that are early indicators of changes in well-being. We strive to provide pet owners and caregivers with ground breaking insight about their pets to enable a new era of proactive, preventive care. When participating dogs visit a Banfield Pet Hospital, their comprehensive health records will be paired with around-the-clock behavior data collected by Whistle FIT - a smart, collar-worn device - to establish an unprecedented link between health and behavior. Our research team will explore millions of health and behavior pairings collected from hundreds of thousands of dogs, searching for hidden patterns that could be early indications of illness. This program made possible in part through Hotel Occupancy Tax Revenue funded through Experience Bryan College Station and the Cities of Bryan and College Station. A guide to the venues, events, sessions, and speakers at the Third Annual Veterinary Innovation Summit.